Q-switched Nd:YAG laser remains the gold standard for tattoo removal, but still some tattoos are not completely removed in a specified period as desired by the patient. Herein, we present a case report of 23-year-old patient who came to the outpatient department for tattoo removal. The tattoo measured around 20cm × 18cm and was located on the back. Nine to 12 sessions of 1064-nm Q-switched Nd:YAG laser were planned at 4- to 6-week interval. After the completion of nine sessions, all the shades of the tattoo disappeared, but the lines persisted. A trial of increased laser energy and multiple-pass R20 treatment was performed, which rather increased the scarring and no improvement in tattoo clearance was noticed. We tried mini-punch skin excision for clearing the remnant tattoo lines. The tattoo was cleared successfully without significant scarring. Mini-punch skin excision is a very promising technique, similar to the follicular unit extraction technique of hair transplant, for tattoo removal of the patients who want immediate results as compared to lasers that take almost a year, provided the patient accepts the risk of scarring. The art of tattooing has come a long way today. The increasing popularity of tattoo imprints has also increased the requests for tattoo removal because of various occupational and society requirements. Laser tattoo removal is the current treatment of choice, given its safety and efficacy. 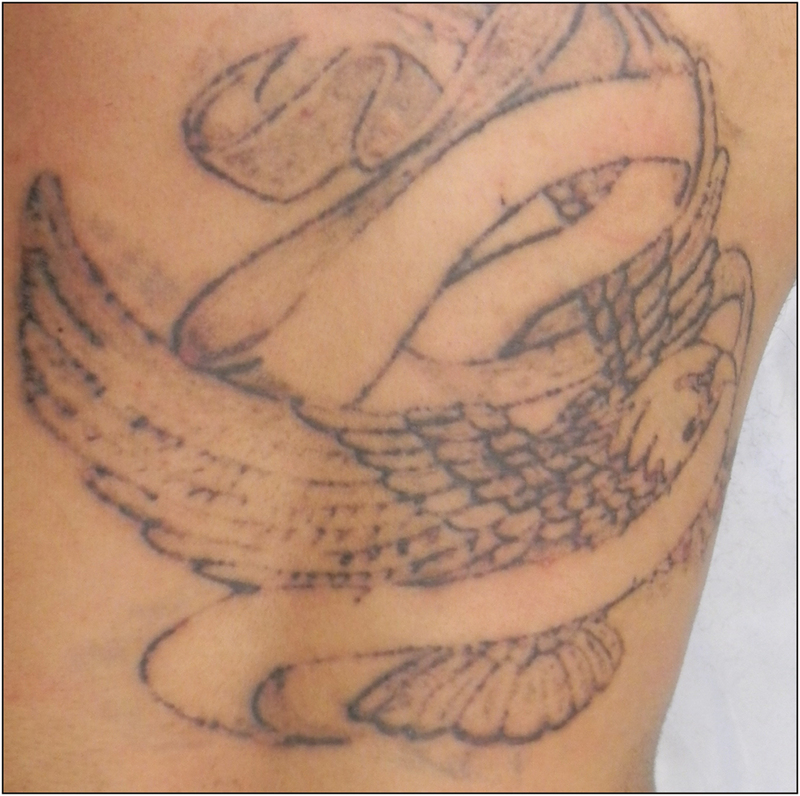 However, it might not be always possible to remove the tattoo completely within a specified period with laser. In this case report, we successfully tried mini-punch skin excision after the completion of nine sessions of laser tattoo removal. A 23-year-old man reported to our outpatient department for removal of tattoo for medical clearance at job. On thorough history and examination, patient was found to have Fitzpatrick skin type 4; the tattoo was made by a professional tattoo maker with different amounts of ink, varying from solid lines to shades of black at different areas. The tattoo was located on the upper and the lower trunk on the back and measured around 20cm × 18cm [Figure 1]. There was no scarring or any layering done on the tattoo. There was no history of isotretinoin treatment, systemic gold therapy, herpes infection, keloidal tendencies, or excessive sun exposure habits. Keeping in mind the patient’s treatment objective, expected outcome, potential risks, and downtime, 9–12 sessions of 1064-nm Q-switched Nd:YAG laser were planned at 4- to 6-week interval. Standardized digital photography was done to record the baseline appearance and any subsequent improvement. After the completion of six sessions, all the shades of the tattoo disappeared [Figure 2], but the lines being too thick and prominent persisted. Further, three sessions of increased laser energy, and single multiple-pass R20 treatment (four laser passes at 20-min intervals in a single sitting) rather increased the scarring and no improvement in tattoo clearance was noticed after 4 weeks. His selection in the services for the next year was again withheld due to persisting tattoo. His treatment objective was not completed, and thus, a newer option of mini-punch skin excision was suggested to the patient for which his informed consent was taken after explaining about the predominant side effect of scarring. A trial run in the small area was planned over the tattoo. The procedure was performed under the infiltrative local anesthesia (1% xylocaine). Mini-punch excision with power punches of different sizes varying from 0.8 to 1mm diameter, keeping depth around 3–4mm, was performed to excise dark prominent tattoo lines. The wound was dressed and the patient was assessed every third day for initial 2 weeks for any local wound complications. 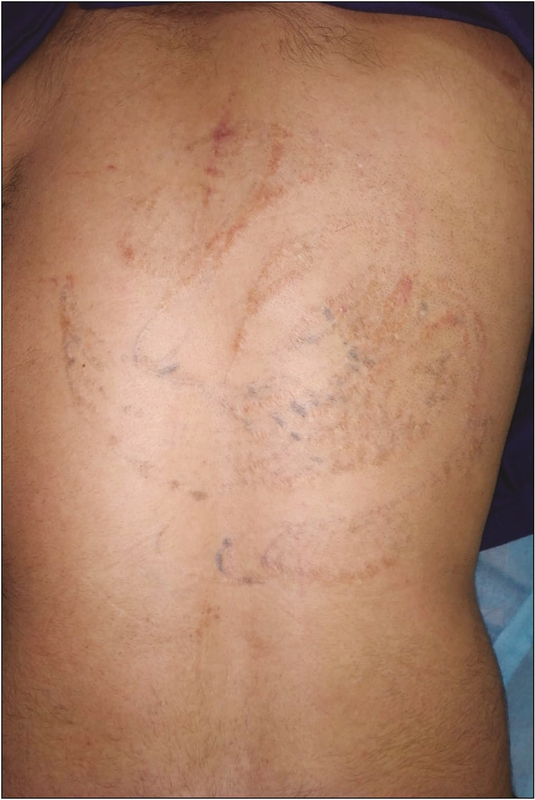 After 6 weeks of the trial run [Figure 3], the patient was satisfied with the results and amount of scarring and agreed on getting it done over the whole area. The tattoo was completely removed from the area by mini-punch skin excision. The patient was satisfied with the results but lost to follow-up. The patient reported after 3 years of the last procedure for some other skin consultation. 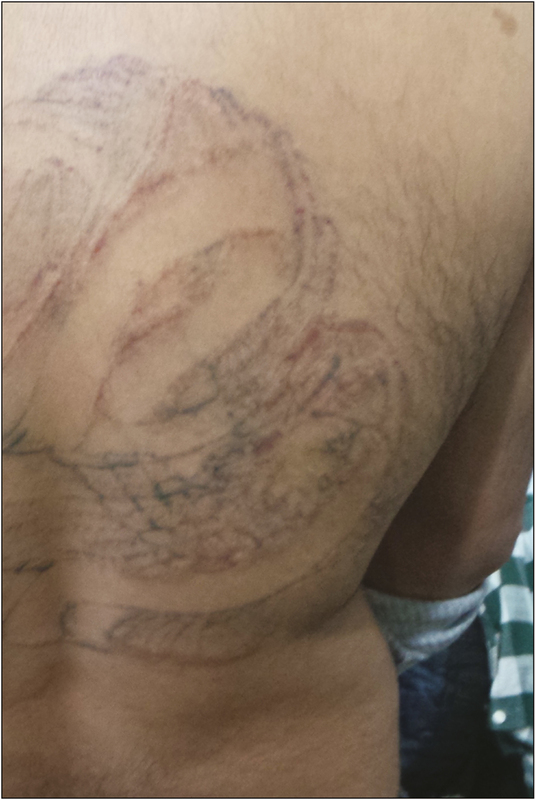 The tattoo was cleared successfully without significant scarring and he got the medical clearance at the job [Figure 4]. Through the years, many methods of tattoo removal, such as dermabrasion, salabrasion, surgical excision, and freeze-burning the tattooed skin with liquid nitrogen, have been explored; however, multiple laser treatments to remove a tattoo via selective photothermolysis remain the gold standard. Here, in this case, we used Q-switched 1064-nm Nd:YAG laser for tattoo removal, which because of its longer wavelength, higher fluence, and shorter pulse is a better laser for the black and dark blue/black tattoo pigment. Response to Q-switched 1064-nm laser depends on the type of tattoo. The Kirby-Desai Scale is a useful index to correlate with the number of treatment sessions required for satisfactory tattoo removal. It is based on six tattoo criteria: skin type, location, color, amount of ink, scarring, and layering. In our case, after the completion of nine treatments of Q-switched Nd:YAG laser, the lines of the tattoo were very prominent but the shades were gone. Combination lasers (fractional and nonfractional ablative lasers), multiple-pass treatments (R20 and R0 methods), and picosecond lasers technologies are new strategies for faster and more effective removal of tattoo pigments. Accounting for the available resources, multiple-pass treatment was tried in our patient but with no success. Because the area of tattoo removal was too big to be removed by surgical excision, a novel method of mini-punch skin excision was tried for this patient to efficiently remove tattoo lines with minimal side effects. There are not much data in the literature on this technique as this is the improvisation of the follicular unit extraction (FUE) technique for tattoo removal. In this method, multiple skin punches using motorized sharp punch were taken from the area of the tattoo similar to FUE technique of hair transplant, and thus, the tattoo lines were cleared with minimal scarring. The only side effect associated with this technique is the tissue scarring, depending upon the skin area on which it is to be performed. The procedure is painful as compared to lasers with a downtime of 1–2 weeks. Mini-punch skin excision is a very promising technique for tattoo removal in patients who want immediate results as compared to lasers that take almost a year, provided the patient accepts the risk of scarring. As this technique punches out the skin till the dermal layer, a surrounding layer of normal skin is required to heal up the whole tissue. Thus, this procedure is restricted to be used on smaller tattoos and tattoo lines. It can be effective in shaded tattoos if the shades have been removed by laser, whereby the few leftover tattoo lines can be removed by this procedure. Kirby W, Desai A, Desai T, Kartono F, Geeta P. The Kirby-Desai scale: A proposed scale to assess tattoo-removal treatments. J Clin Aesthet Dermatol 2009;2:32-7. Kuperman-Beade M, Levine VJ, Ashinoff R. Laser removal of tattoos. Am J Clin Dermatol 2001;2:21-5. Shah SD, Aurangabadkar SJ. Newer trends in laser tattoo removal. J Cutan Aesthet Surg 2015;8:25-9. Barua S. Laser-tissue interaction in tattoo removal by Q-switched lasers. J Cutan Aesthet Surg 2015;8:5-8. Ho SG, Goh CL. Laser tattoo removal: a clinical update. J Cutan Aesthet Surg 2015;8:9-15.